The proportional term makes the current error signal multiplied with a gain (Kp).The result will be output signal. The integral term makes the current error signal value and duration multiplied by with a gain (Ki). The result will be the output signal. The integral of a signal is the sum of all the instantaneous values that the the signal has been,from whenever you started counting until you stop counting. The integral term (when added to the proportional term) accelerates the movement of process towards setpoint and eliminates the residual steady-state error that occurs with a proportional only controller. The derivative term makes the rate of change the error signal multiplied with a gain (Kp).The result will be the output signal value. -e(t) is the error signal . The derivative term slows the rate of change of the controller output and this effect is most noticeable close to the controller setpoint. 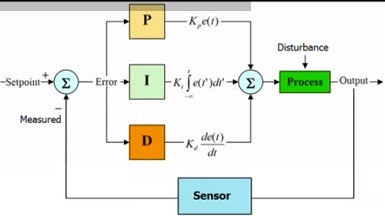 Here is block diagram of a PID control system. The setpoint is the value that we want the process to be. The output must be equal to the setpoint,else error signal will not be zero. A disturbance is added to system. Example – Friction to shaft of the motor. The setpoint is subtracted from the measured to create the error. The error is simply multiplied by one,two or all of the calculated P,I and D actions. Then the resulting “error x control action” are added together and sent to the controller output. Learn how to read an electrical drawings?